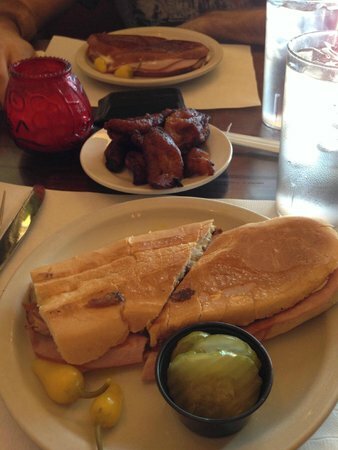 Ham, roasted pork, swiss cheese, mustard, mayo & pickles on cuban toasted bread. Roasted pork, ham, mustard, mayo, pickles on semi-sweet roll. Thinly‎ sliced top sirloin w/ grilled onions on French fries & cuban bread. 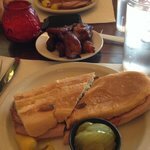 Roasted pork, on cuban bread, topped w/ grilled onions & mojo sauce. Nicely‎ seared top sirloin steak cooked to your satisfaction topped w/ grilled onions & served w/ rice, beans & fried platains. Breaded & fried. Served w/ rice, beans & fried plantains. Hand cut 10oz. Well seasoned & cooked to your taste. Served w/ fried plantains. 10oz. Charbroiled well seasoned chop. Served w/ rice & beans. Hour oven roasted & fork tender. Basted in BBQ sauce. Pan‎ fried, covered w/ grilled onion & crispy bacon. Served w/ rice & beans. Slow oven roasted, seasoned w/ garlic & citrus juices. Served w/ rice & black beans. Your choice of flame broiled or sautéed, marinated in citrus juices & garlic. Served w/ rice & beans. Marinated in jamaican spices, seared & finished in oven, a local favorite. Two large pieces of cod, breaded in-house upon your order. Served w/ rice & beans. 8oz. Seared & finished in the oven, light & flaky. Served w/ rice & beans. Your choice of tomatoes & garlic, or cajun blackened. Served w/ rice & beans. Large‎ tiger shrimp sautéed in garlic, onions & butter sauce. Served w/ rice & beans. Mixed greens, tomato, choice of dressing. Mixed greens, sliced apples, olive oil reduced balsamic, topped w/ goat cheese & candied pecans. Served‎ w/ red onions & mojo de ajo, tomato add 0.50. The original & the best, often imitated, never duplicated mom's recipe since 1969. 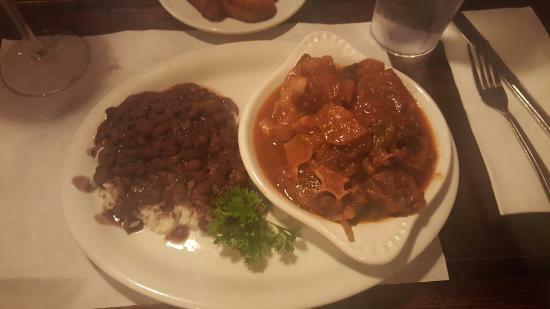 Served‎ w/ small & fried plantains. Grounded beef in cuban seasoning. Braised in tomato sauce. An old favorite. Stewed beef in tomato & garlic sauce. Served w/ rice & beans. Braised beef eye of round. Served w/ brown sauce, rice & beans. Aroma di Tantilizing. Cibo OK.
Squisitamente autentici, ACCESSIBILE. Il servizio era buono, l'atmosfera era piacevole . Ritornerei di sicuro con amici e parenti. Ricevi risposte dal personale della struttura Baracoa Cuban Cafe e dai visitatori precedenti.